Not everyone was born to talented long-distance runners, so it shouldn’t come as a surprise when Shalane learned that her weekly family tradition was unique, or even bizarre. But when she said this during an interview with Anderson Cooper, it made me laugh and think. Over the years, the Sunday Long Run has become more than a weekly run, it’s become a ritual. Three out of four weekends of every month typically feature a run of 13 miles or longer. It is simply a thing I do now, like going out on a Saturday or watching The League on Wednesdays. So when she said those words, Church of Sunday Long Run, I realized with some consternation that perhaps I did belong to a religion (though outsiders may call it a cult). But every church or religion has to have its high holiday. And that for me, without a doubt, is the second Sunday of October, when the city hosts the unrivaled Chicago Marathon. That wonderful day is like Christmas to me, a magical time of year when extended family descends on Chicago for a weekend of big meals, shopping and fond reflection. The city teems with people from all over the world with flags proudly draped over their shoulders. Reservations at Italian restaurants are impossible to get, the Magnificent Mile enjoys rising revenues and all around are eager, nervous faces ready to run and get to know the Windy City. I haven’t run the Chicago Marathon since 2011, but I’ve always been in town for the celebration. Every year I have a blast seeing the multicultural hordes on the trains, cheering for each runner who puts their name or country on their shirt, and hosting the ceremonial Deep Dish meal after the race is done and the city shines with the glint of swinging medals. For the last two years, I have escorted people to my favorite spectator spots in hope of seeing their significant other’s first ever attempt at 26.2 miles. But this year, I was given no such duty, so I visited the course with Otter to see the elite race play out in four different spots. We watched the East African lead pack rocket up LaSalle Boulevard around mile 4, gliding past us almost effortlessly. They ran easily, lightly on their feet. You could be forgiven for thinking they were barely trying. They ran alone, with the next cluster of runners a block away. Tucked in the middle was Kenenisa Bekele, already a legend in the running world, wearing the coveted #1 bib, as defending champion Dennis Kimetto had chosen to run Berlin instead, where he ran a gobsmacking world record. Around him were the other top stars, Eliud Kipchoge and Sammy Kitwara, accomplished runners in their own right competing for their first World Marathon Major victory. They continued their blistering pace down Wells Street at mile 11. Wesley Korir, the 2012 Boston Marathon champion and 5-time Chicago finisher, had dropped from the lead pack but stayed close to the leaders. His full-time job as a member of Kenya’s parliament had surely taken a toll on his training, but that wasn’t stopping him from running a world-class time. 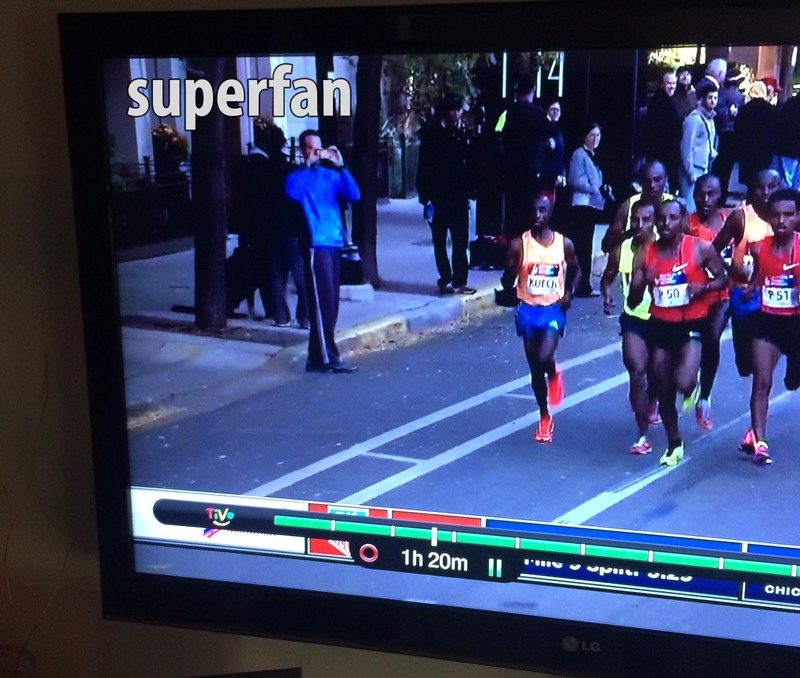 By the time the elites had reached mile 21.5 in Chinatown, we were down to an aggressive lead pack of three Kenyans. Kipchoge, Kitwara and 2014 Tokyo Marathon champion Dickson Chumba led the race, having recently dropped Bekele. The Ethiopian great was not far behind, but at this stage in the race, it was all but guaranteed that he was not going to make the podium despite his impressive track credentials. We reached our last spectator spot at the base of “Mount Roosevelt,” the only significant hill in the entire race, sadistically located at mile 25.9, just in time to see the winner. By the time the pace car arrived, there was just one man running behind it – Eliud Kipchoge, donning a neon yellow singlet, hammering out a celeritous pace, chasing his 2:04:05 PR from last year’s Berlin Marathon. About twenty minutes behind him was the female leader, Rita Jeptoo, who went on to win her second consecutive Chicago Marathon and fourth straight World Marathon Major. If she wasn’t already the #1 female marathoner in the world, then there’s no doubt about it now. Just a few minutes behind her was top American Amy Hastings, who equaled her personal best of 2:27. I would have followed the female elites more closely but it would have prevented us from seeing the male competition at every spot. By finishing in 2:04:11, Kipchoge ended up missing both the course record and his personal best, but nonetheless gave Chicago a brilliant performance. Not only was it the third fastest time ever run in Chicago and the Western hemisphere on a record-eligible course, but he did it all smiles. And why wouldn’t he? This is the best race in the world. It has a pancake-flat course, thousands upon thousands of eager spectators, twenty-nine distinct neighborhoods, and an incredibly deep elite field that always put on a real race. Oh, and the weather has been absolutely perfect for the last three years. Seriously, I should demand that race director Carey Pinkowski pay me not to run, because it basically guarantees ideal conditions. I already know that I won’t be running the 2015 Chicago Marathon (you’re welcome, everyone) for the same reasons that I haven’t run it the last three years: there are other states to conquer. 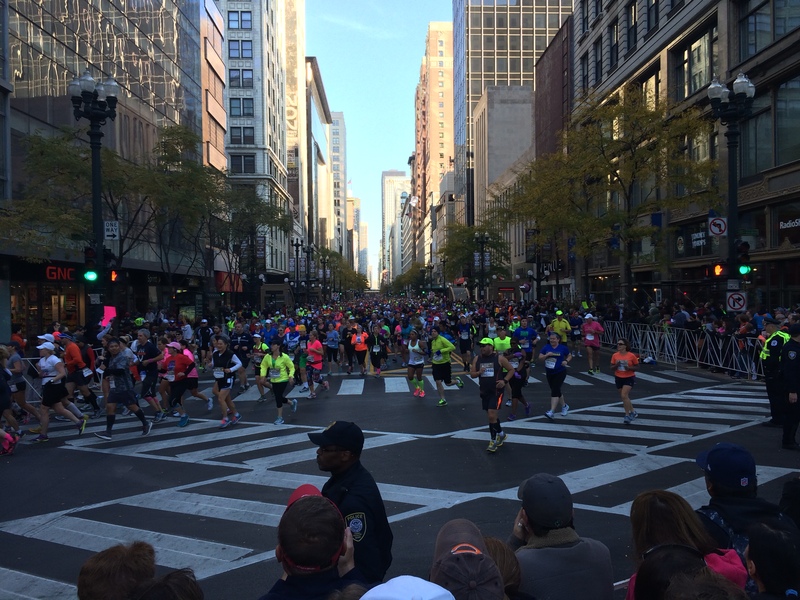 By running Chicago, I am essentially not running a host of other races that could help me reach my goal. And yes, the lottery system is also a huge bummer, but at least I don’t have to deal with hometown rejection for another couple of years. As Mike said, the London, Berlin and Tokyo marathons will provide that in spades over the next decade. But that doesn’t mean that I won’t relish the day when it arrives yet again next October. I will be there, along with all the other acolytes of the Church of Sunday Long Run, cheering happily with a hint of vicarious envy, for the world’s fastest runners and the 40,000 athletes behind them. Congratulations to every proud finisher! Great race report. I’m tempted to register for 2015. My goals being slightly different from yours (50 marathons by age 50 rather than one in every state), I typically gravitate to Chicago as my first (or sometimes second) fall marathon. It’s such a great hometown race, and you captured the anticipation and excitement perfectly in your post. I loved that you mentioned the names of so many elite athletes that illuminate the firmament of our sport. I’ll probably register for 2015 too when that time comes around. I might have named this post “Open love letter to a hometown race”. I’m not sure I could convince myself that any one race was the best in the world, but damn you make a strong case for Chicago. And nothing I saw as a visiting runner in 2012 contradicted your story. The fact that total strangers on the street smiled at and congratulated me upon seeing my medal still wows me. Now if only you could find a way to turn back the clock and free her from her lottery-induced shackles.